Battle of Hoth: Go from the start along the map clockwise and you will find all Collectibles. The last item is located in a narrow passage in the ice cave. Hero Battle on Hoth: On Hoth you can choose any hero for the collection, because the salvage objects are all located on the ground and a jetpack is not necessary. Battle of Tatooine: Here you have to equipment with the jetpack, because the collectible is on the transport ship in the center of the map and without Jetpack you cannot reach it. 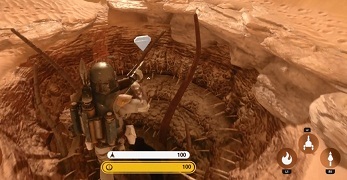 Hero Battle on Tatooine: Here you need Boba Fett, but make sure that it does not share its fate, because the last collectible is located above the maw of the Sarlacc, the Bounty Hunter knows all too well. Battle of Endor: Go counterclockwise and you will find all Collectibles gradually in the dense forest of the planet Vegetation. Hero Battle of Endor: The first four salvaging objects are easy to find, but for number five, it needs again Boba Fett, because it is in the reactor chamber of the imperial bunker at the back on one of the Tesla coils. Battle of Sullust: Here again you need a jetpack to jump on the AT-AT, and then outside of the base to the container and a shelf. Hero Battle of Sullust: Again you need Boba Fett. The collectible is located just to the right from the starting point, it is hidden on a pile of boxes, on the head of the AT-AT, and on a concrete pillar in the outside area. Survival Mission on Tatooine: The dusty Tatooine required you to equip with your jetpack, because all collectibles are located almost exclusively in midair. Jump ideally on the hill from where a cairn is located and one of is a tent of the Sand People. Survival Mission on Sullust: On Sullust you need a jump pack, which is located on a lake of lava in the air only for the last salvage object. Survival Mission on Endor: The map of Endor is very large. Turn around at the beginning and collect the first salvage. Keep yourself then on the edge and collect them on a clockwise. Survival mission on Hoth: For this survival mission you don’t need to equip with jump pack. The salvaging objects are all located in the immediate vicinity on the ground.